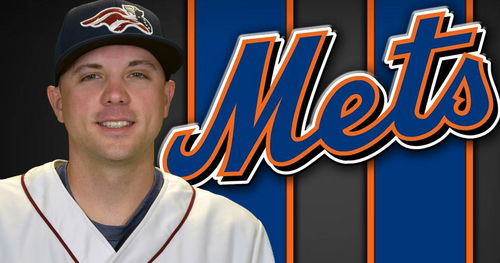 Bridgewater, NJ – The Somerset Patriots have announced that left-handed pitcher Aaron Laffey’s contract has been purchased by the New York Mets. Laffey is expected to report to Triple-A. Laffey was 2-0 with a 3.10 ERA and 13 strikeouts over 20.1 innings pitched in four starts for Somerset this season. 2018 was his second season with the Somerset Patriots and in the Atlantic League. The southpaw carried a 1-1 record with a 2.82 ERA over four starts with the Somerset Patriots last year, including five shutout innings with seven strikeouts in his first start of the year. He struck out 19 batters over 22 innings before his contract was purchased by the Arizona Diamondbacks organization on May 15. He went 5-3 over 21 appearances (13 starts) with Triple-A Reno to finish his 2017 season. He becomes the third player to have his contract purchased by a Major League organization off the 2018 Somerset Patriots roster. Pitchers Scott Copeland (New York Mets) and Brett Oberholtzer (Colorado Rockies) each joined MLB teams during Somerset’s spring training in mid-April.